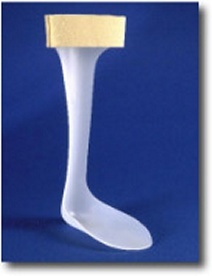 PRODUCT DESCRIPTION: This lightweight AFO is designed to assist ambulation for those patients suffering mild to moderate neurological deficit resulting in drop-foot. The anatomically correct shape will fit inside most lace-up shoes. It is fabricated from specially formed orthopedic grade thermoplastic and offers durable long term performance and reliability. For a more comfortable individual fit the orthosis may be custom trimmed and reshaped using cast scissors and a heat gun.